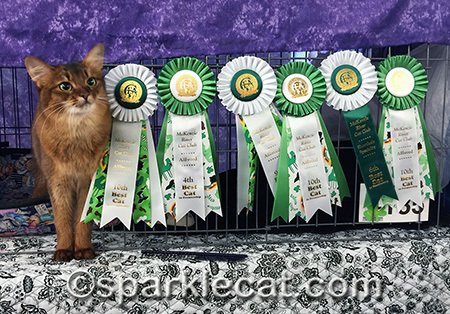 I got to fly up to Portland to compete in the McKenzie River Cat Club cat show in Portland, OR! I’ll tell you all about the flight and my visitors tomorrow (it was all very exciting! ), but today I’ll tell you all about the actual show. 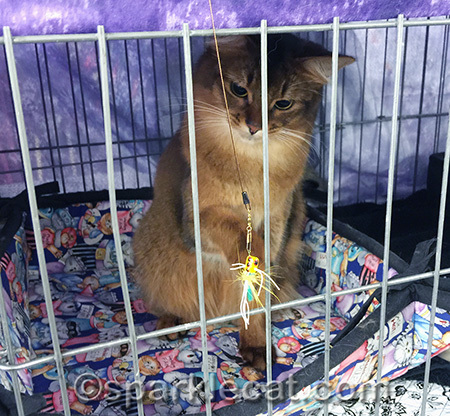 My human thought it was ridiculous to pay a baggage fee to fly my usual Sturdi cage up with me, so instead she requested a standard cage to be set up for us. It took a little getting used to. The fun part was that I could reach out between the wire bars and touch stuff! Including the curtain of the cat next to me. 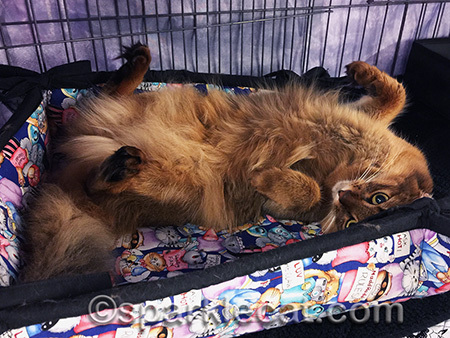 His name is Bing, and he’s a Manx who is doing extremely well this season! He looks like he is worried about me messing with his curtains. My human agreed and told me that was not allowed. This wasn’t allowed either… but it was really fun! 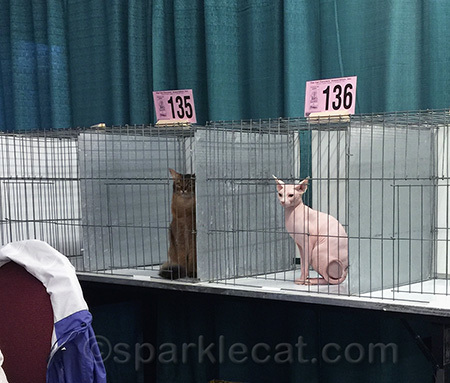 As I mentioned in my last show report, the season is ending, and things are getting really competitive in the cat show world! I figured the best way to stand out was to look as cute as possible, so I practiced that a lot. 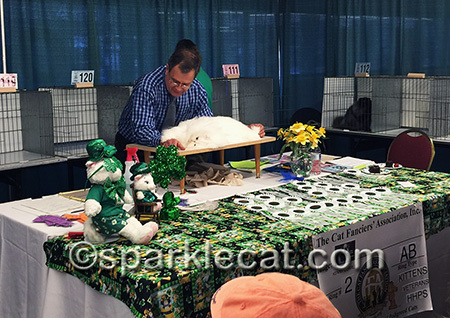 It works too — look at this white Persian! She totally enchanted both the judge and the audience. Since we cats are given numbers alphabetically, the kitty next to me happened to be a Sphynx, and she was very sweet and pretty! If she had fur, it would be white! Her skin was utterly perfect, and she was nearly as charming as the white Persian! She’s new to showing, and I think she will do well. 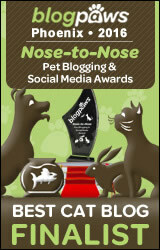 I thought you might like to see some cats in the Household Pets Category being judged, so here you are. 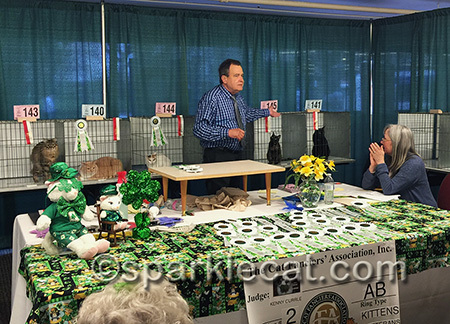 There were two cats vying for the Best Cat ribbon, and the judge was getting a consensus by getting the audience to applaud (mixed breed cats don’t have any standards to conform to — they are lucky and have more fun). The cat that got the biggest response was this tortie, #145! She reminded my human a lot of Binga. 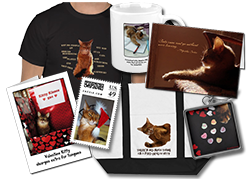 We breed cats get applause too, but the Household Pet humans are a wilder, more raucous bunch! 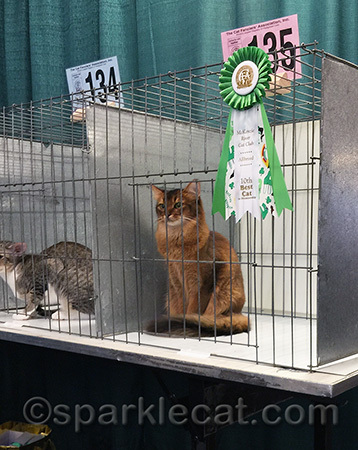 Did you know that sometimes if a rescue cat is having a hard time getting adopted, if the rescue humans do cat shows, they bring the cat to a show because every kitty gets ribbons — and they hang the ribbons on her cage back at the facility. It makes her look special (which all cats are), and she usually gets adopted a lot faster! Here I am with one of my ribbons. But you know what’s even better than ribbons? A new toy! My human found this at a vendor booth between judging rings and thought I would enjoy it. She was right! My two days competing in Portland were exhausting but lots of fun! And I got six ribbons! That means that, out of eight rings, I finaled in six! In fact, I finaled in all four rings on my second day — that was a first. So I did really well. But just wait til you hear about the rest of my trip. It was even more awesome! Congratulations, Summer, on a job well done – you rocked that Portland show! 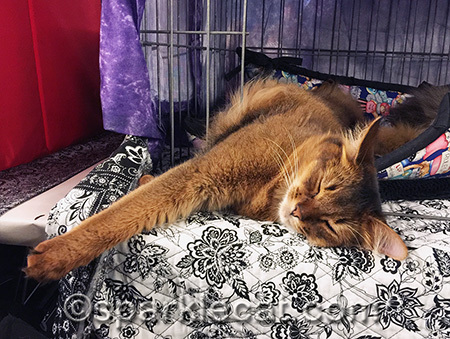 I hope to meet you at one of the local shows one of these days – although we don’t show Tsunami or Magellan, we attend the shows whenever we can to see all of the lovely cats and to look for special surprises for them! You did well sweetie! Very well ! 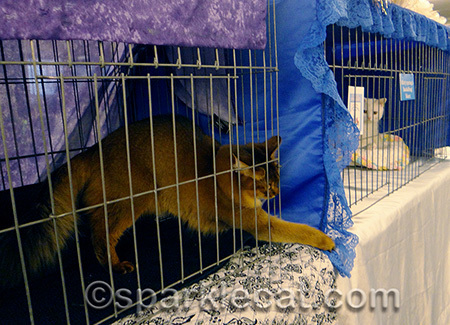 :)Our Mama misses going to cat shows. She used to find us some pretty amazing toys and cat beds when she went! We are so proud of you Summer! I’m not even jealous that my mom spent time fussing over you.